Child $49.50: Retail Price $62.00 | You Save $13.50 Children between ages 4 and 11 qualify for this pricing. 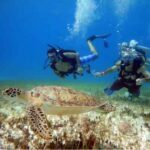 Do you want the best value Tulum tour that gets you back the earliest to your hotel? 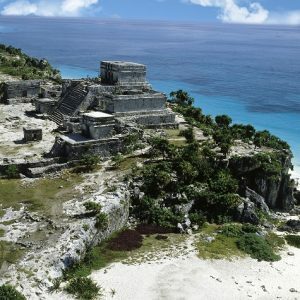 Then the Tulum Express Tour From Cancun is for you! 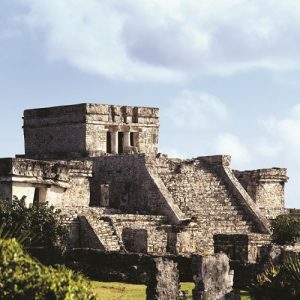 This tour goes straight to the ruins site leaving Cancun early around 7 am and getting you back early around 2 pm! 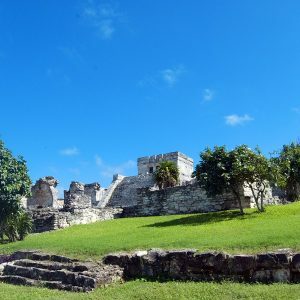 On this tour you do not spend any time with activities outside of Tulum such as Cenotes, or additional stops for food, which is why this tour is called the Express. 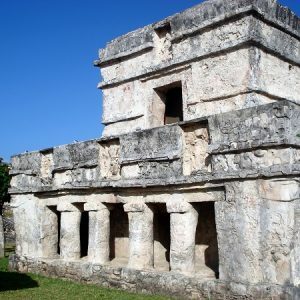 If you are unfamiliar with Tulum, but interested in Mayan history, and the origins of the Mayan Calendar you may find this site especially interesting. One unique feature of Tulum is the large ancient observatory used to map the stars by our distant Mayan ancestors. 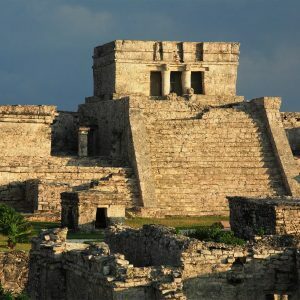 You will learn much of the history of the site from your guide who will give you all the great details during your tour. 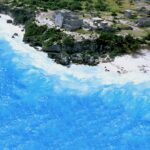 Also another great feature at Tulum is it’s large hidden tropical beach! 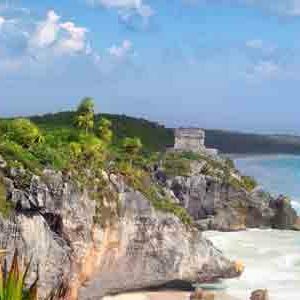 That’s right Tulum was build on a large cliff overlooking the Caribbean Sea and at the base of it is a beautiful white sandy beach protected by cliff on each side. 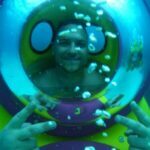 So bring your shorts so you can go for a swim. 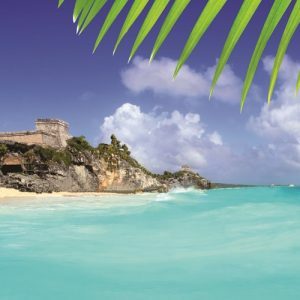 Also remember as you put your feet in the sand you will share the same view and experience of every Mayan to ever live in Tulum. 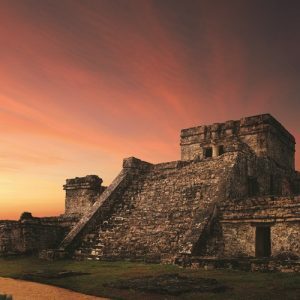 After your visit you will have no question why the Mayans chose to build a city there. 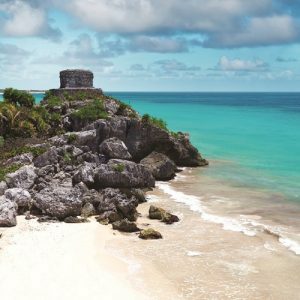 Make a reservation now, and start your Tulum adventure! 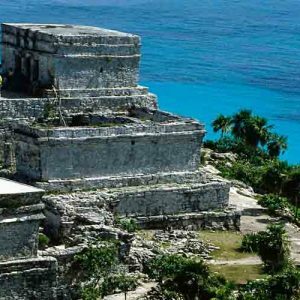 Hotel pick up approximately 7:20 – 8:20 a.m., Tour returns between 2:00 – 3:00 p.m.
Tulum is a beautiful site with a spectacular view of the turquoise Mexican waters. 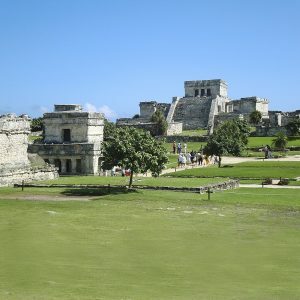 The tour guide provides the history of the different structures and the site in general. There is a nice breeze on the coast,and you can take all the pictures you want! 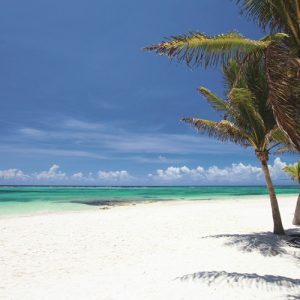 After the tour, relax on the beach and order a drink or take a swim. 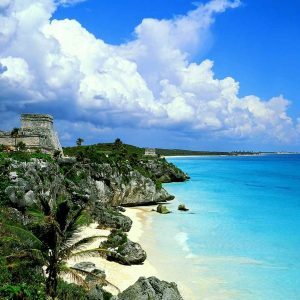 The return trip takes about 2 hours, so you get back to Cancun by 4 p.m.